Today, the Board of Regents of the University System of Georgia named Dr. Jaimie Hebert president of Georgia Southern University in Statesboro. Hebert will assume his new position on July 1, 2016. 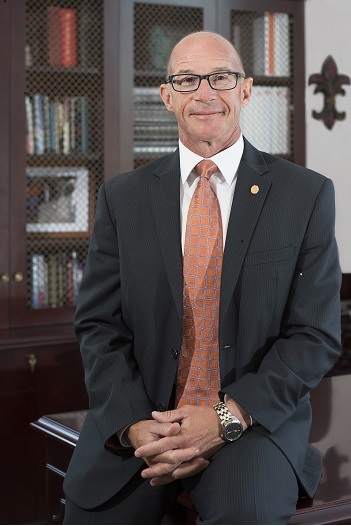 Hebert joins the University System of Georgia from Sam Houston State University in Huntsville, Tx., where he has been serving as the provost and vice president for academic affairs. “Georgia Southern is a great university, and I am honored to have the opportunity to serve this institution, its faculty, staff and students; and, the Statesboro community. I look forward to working with the campus and Statesboro community to take Georgia Southern to even greater heights,” said Hebert. Hebert has served in various roles at Sam Houston State University since 1999. He has worked as a professor of mathematics and statistics, chair of mathematics and statistics, and dean of the College of Arts and Sciences. He has also worked in higher education as an assistant professor of mathematical sciences at Appalachian State University (Boone, North Carolina). Throughout his career, Hebert has been active in University-related, student-related, professional and civic organizations including: the Council of Academic Deans, SACS Compliance Committee (2009 reaffirmation), Standing Faculty Tenure Committee, Texas Association of Chief Academic Officers, Journal of Developmental Education, SHSU Rotoract Club, Tau Kappa Epsilon Fraternity (advisor), Rotary Club of Huntsville, and Huntsville/Walker County Economic Development Committee. Hebert received a bachelor’s degree, master’s and a doctorate in statistics from the University of Louisiana-Lafyette. Hebert has two daughters. Emily is a graduate student and Sarah is an undergraduate student.